if you've ever watched track racing, particularly at national and international level, you may be familiar with the warm down, where riders having just crossed the finish line at speeds you and i can only dream of, particularly me, who has failed miserably to ride anything confidently with a fixed gear, climb aboard something with gears (see, i told you freewheeling would catch on) and meander slowly around the centre of the track. i believe the principle is sound enough, where the muscles are not left to fend for themselves, wondering what on earth they're going to do with all that lactic acid, and why they seem to have lost gainful employment. keeping them in some sort of productive endeavour will let them adjust to their temporary relaxation, before they get hammered again in the repechage. now, i know you won't believe me, but a similar principle can be implemented with regards to cleaning the bicycle after a happy ride, particularly those inhabiting a sunday morning, perhaps easing into sunday afternoon. yes, cleaning up about the house definitely comes under the heading of chores i'd rather avoid, but this is the shiny bike from the bikeshed, the one that gives so much gratification on cold, frosty and sunny days like today. don't they deserve some fettling and tender loving care? i would think that they do. 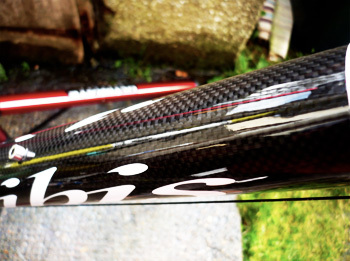 additionally, it can be said, personally being separated from the largely efficacious act of pedalling is a hard state to encompass; the ideal time to clean the bike. there is still a lot to be said for a bucket of soap and water; that'll shift much of the muck, but it's not so hot on the greasy bits, particularly the chain, chainrings and those jockey wheels. the latter are most important, because there is little better than that lovely purring sound of a clean chain threading through two little cogged wheels running on ceramic bearings. 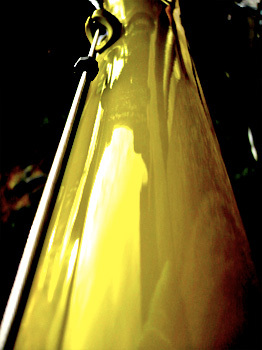 soap and water, however, is not the ideal way to implement bike protection after the washing process is ended. but the modern way is the three-step skoosh, purveyed by many, but now brought together as an end-to-end package from the chaps at purple harry. you may remember those scutteringly brilliant abrasive pipe cleaners that can remove untold amounts of gunk from between sprockets and chainrings. what was missing from that picture was some sort of degreaser to aid those pipe cleaners in their search for industry. well, fear not, for the ommission has been remedied, and then some. there's now a spray to loosen encrusted dirt and muck, a spray to degrease those oily and greasy components; you all know of which i speak. 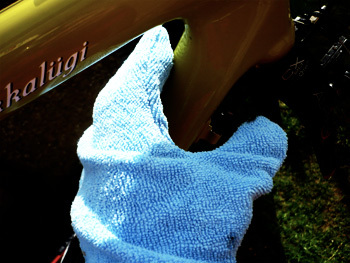 and finally, there's a pink (not purple), creamy liquid that can be squirted directly onto the frame tubes (all products are carbon safe) or onto the piece de resistance, the lobster cleaning mitt. having tried manfully to cover the ibis hakkalugi in as much gloop as it was possible to find in bridgend woods (sadly, not as much i'd hoped), my post ride rest and recuperation consisted of popping the bike on the workstand, removing both wheels and setting about giving the accumulated forest as hard a time as possible. how much fun can one man handle? having sprayed everything in sight with the cleaner and degreaser, i filled a bucket with a small amount of warm water, and scrubbed like there was no tomorrow. 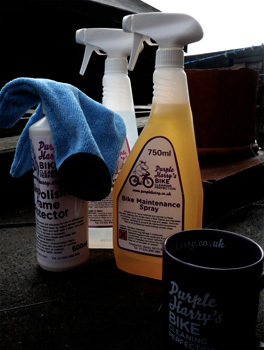 step one completed, the whole ibis, apart from the brake pads,was sprayed with purple harry's maintenance spray which protects and lubricates all the bits and bobs that make a bike, a bike. the cunning part here is this spray's propensity for removing moisture in its quest to keep the wheels turning. the last step in the process is to don said lobster mitt (light blue rather than the purple you would expect) and squeeze some pink polish and make that frame so shiny you could brush your hair in it; you may be surprised to hear just how close to the truth that statement is. all this can be accomplished for a smidgeon less than £30 (not including £12.99 for a multi-pack of bike floss pipe cleaners), the ideal way, im sure you'll agree, to participate in that post-ride warm down while almost incidentally providing you with an embarrassingly clean machine for the next sunday, monday, tuesday, wednesday, thursday, friday or saturday ride.